If not for the change in Michelle Jonas' hairstyle, you would never know she's in the midst of treatment for stage 2B triple-negative breast cancer. "It's just a phase of my life, and it's just something that I need to get through," the 41-year-old Crook County High School principal says stoically. In true Michelle Jonas fashion, she faces this challenge like it's nothing more than a ball game that she's determined to win. 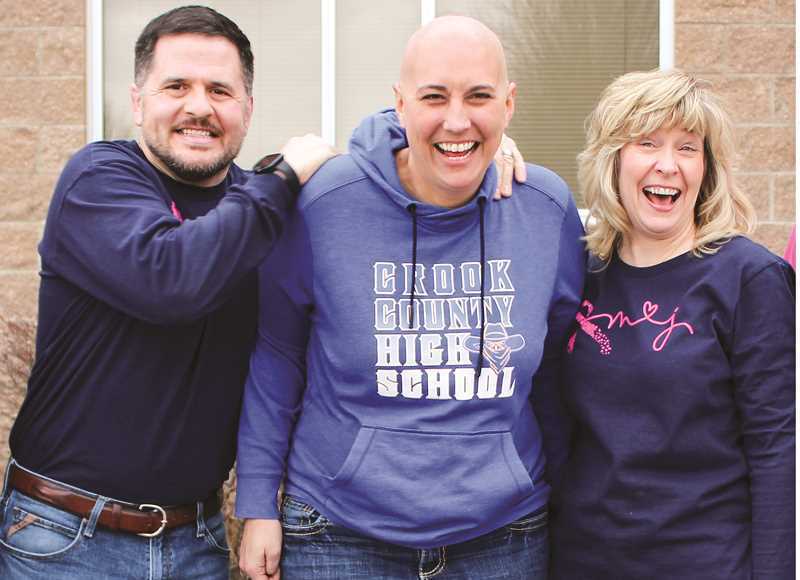 "Michelle isn't letting the cancer get her down," says Crook County School District Director of School Improvement Joel Hoff. "Even with such a heavy burden, she still is able to show up to school each day with a smile on her face and a positive attitude." After turning 40, Jonas did just what she was supposed to do — go in for a mammogram. So, in November of 2017, she did her womanly duty, and all was good. But the following October, she found a lump in her right breast. She saw her doctor, who ordered a mammogram and then a breast biopsy. It was Friday, Nov. 9, 2018, when she got word that she had stage 2B triple-negative breast cancer. "We don't have any family history of cancer at all, so it's kinda crazy," Jonas says. Triple-negative breast cancer is cancer that tests negative for estrogen receptors, progesterone receptors, and excess HER2 protein. Stage 2 refers to the size of the tumor and the fact that it's in at least two armpit lymph nodes. "They're faster growing tumors," Jonas said, noting that doctors looked back at her first mammogram from the prior year, but there was no evidence of the tumor. With this type of cancer, doctors start treatment with chemotherapy. She'll then have surgery in late May and then end treatment with radiation. Last Friday was her final dose of two types of chemo. She had treatment every other week for eight weeks. "At this point, I have been able to continue to be at work on days that I am not having chemo," Jonas said. "I'm a little more tired. As long as I stay up on the anti-nausea medication, I'm doing pretty good." This Friday starts another type of chemo – and another set of side effects — and she'll have it each Friday for 12 weeks. Once those treatments are done, she'll have two to four weeks to heal and recover before surgery. After surgery, she'll have four weeks to recover before ending her treatment with radiation. She needs radiation treatment because cancer is in at least two of the lymph nodes. Jonas will miss school when she's out for surgery, but radiation treatments will most likely happen during the summer, so it will not require her to miss work. On the days that she can't be at CCHS, people from the school district office are there to fill in the gap, making sure all the needs are met. "I think it's nice to have a community of people that are willing to step up and help out when you need it," she says. She's also relied on the support of her family — her husband, Travis, her in-laws, and her parents, who come from Eugene to help out. Her 13-year-old daughter and 11-year-old son were quite nervous at the beginning of her diagnosis but are doing better, seeing that their mom is doing fine. "My goal for the school and for my family is just to do life as normal," Jonas says. She's also glad for the support from her friends and community. "Living in Prineville, you're so lucky that it's like a big village, raising your family together," Jonas said. "For sports practices or games, when there's stuff I can't make because of appointments, relying on those people to help shuttle kids around." She says her staff has also been amazing as well as CCHS counselor Ann Kasberger, one of her good friends who went through breast cancer treatment a few years ago. "She's been a great resource for me," Jonas said. "When going to doctor appointments and things like that, it's always good to have another set of ears." She says her students have been "super sweet" and often ask, "How's your cancer going?" "They're pretty open about it," Jonas says. "Some students were concerned. They were like, 'What are you going to do when you don't have any hair?' I'm just like, 'Well, I'm not going to have any hair.'" Doctors had told her that her hair would begin to fall out around 15 days after her first dose of chemo, and just like clockwork, her long, thick, black hair began to thin. Jonas knew she would need to break the news to her student body before it became obvious that something was not quite right. So, before winter break, the Connections teachers read a statement to their students, informing them of their principal's diagnosis and treatment plan. "Once it was falling out pretty good, my brother cut it and then buzz cut it, and it continued to fall out," Jonas said of her hair. "Then my girlfriend from high school, she just Bic razor shaved it off." She plops a hat on her bald head when she goes outdoors in the frigid weather, but otherwise, she's fine without hair. "I'm not a big hair person anyways. Everybody has their thing, and to me, it's not a big deal. Sometimes I catch myself when I walk by the mirror, and it's like oh, wait — double take kind of a thing," she laughs. But this isn't the first time Jonas has been bald. When she taught math at Crook County Middle School about 12 years ago, a student there had cancer. Classmates rallied around the student and did a fundraiser. Every time they reached a goal, they shaved someone's head. "They reached the amount, so they shaved my head at an assembly," Jonas said. "So I've been there, done that. It's a little different. Eventually, I might lose my eyebrows, I still haven't yet, but I know what it's like to be bald." Jonas doesn't expect — or even really want — people to shave their heads to show their support, nor does she want anyone to do fundraisers for her family. She noted that she has good insurance coverage. Her coworkers have been sporting blue T-shirts featuring the pink breast cancer awareness ribbon with hearts and MJ, her initials. The School Resource Officers wear their pink shirts on Thursdays. The CCHS cheerleaders did a little cheer for her, and the leadership kids decorated her office for Christmas. Jonas says everyone has been very kind and helpful throughout her ordeal, even though they can't believe she's still working. But, she assures them, she feels fine. "I'm doing what I need to do, and it helps pass the time of getting through the year of just being normal and doing normal as much as I can," she says. "Let's just keep life going."